Today, Wednesday, 1 January 2014, on New Year’s Day, Cardinal Raul Eduardo Vela Chiriboga, Cardinal-Priest of S. Maria in Via, the Metropolitan Archbishop Emeritus of Quito, of Ecuador, turns 80, and therefore, according to the rules written in the Apostolic Constitution Universi Dominici Gregis, he loses his right to vote in any future conclave. 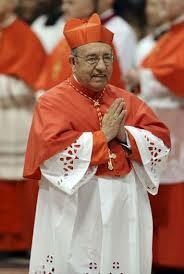 Cardinal Raul Eduardo Vela Chiriboga was made Cardinal-Priest of S. Pudenziana by Pope Benedict XVI in the 2010 Consistory of Cardinals on 20 November 2010, the third Consistory of his pontificate. Cardinal Vela Chiriboga was made a Cardinal in honour of his service to the Church as the Metropolitan Archbishop of the Metropolitan Archdiocese of Quito in Ecuador from 2003 to 2010, retiring just before he received the red hat from the Pope. 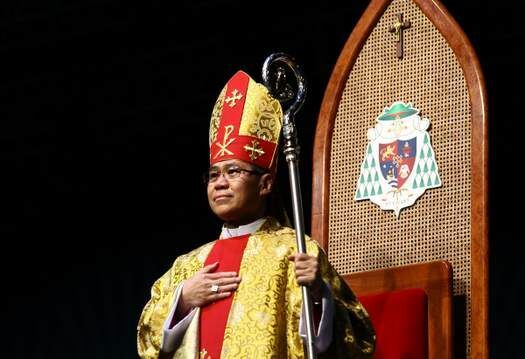 May God bless His Eminence Cardinal Vela Chiriboga, with a blessed old age and health. 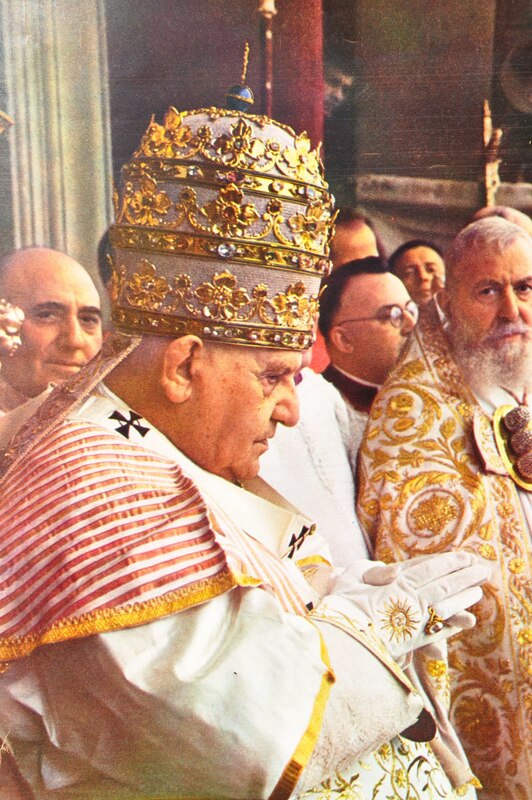 May he remain strong in the faith and hopefully can perhaps still continue to work great graces and good works of love and peace in his old age and retirement, as he continued to minister to the people of God. The College of Cardinals now stands at 199 members in total, with 107 Cardinal-electors and 92 Cardinal non-electors. There are now vacancy of 13 Cardinal-electors as compared to the maximum number of electors allowed in the Conclave of 120, although Popes John Paul II and Benedict XVI had sometimes surpassed this limit. 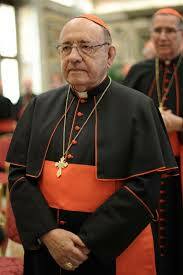 Next Cardinal-elector to age out (80) will be Cardinal Giovanni Batista Re, Prefect Emeritus of the Congregation for Bishops, on 30 January 2014. Today we glory in Jesus Christ, and we praise Him with the greatest exaltation we can give. Indeed, we ought to do that every single day of our lives without ceasing, with every single breath that we take. For it is through Christ that we have life, and it is also through Christ that we have hope for a new and everlasting life in joy and happiness. Why is Jesus so special? And why is He so important to all of us? That is because as we all know, He is God Himself, and yet He is not a distant and unloving God who lords Himself over us as gods typically do, in our understanding of the term divine. Instead, Jesus is the Word, who is God and who is with God since the very beginning of all, begotten of the Father not created, and who emptied Himself of His glorious divinity, so that He might be born into this world, as one of us, a lowly human. His coming had been prophesied by the prophets and the messengers of God for many millennia, and His coming had been expected and awaited by the people of God. God was known as the God named I am who I am, or YHVH in short. His Name is holy, and as one of the Ten Commandments stated, that the people of God must treat this Holy Name with the greatest respect. We who are the most beloved ones of the Lord’s entire creation, had sinned against Him and rebelled against His will and commands, preferring to trust in Satan rather than in the power of the One and only True God. Yet, God is Love, and in us, He saw that there were good in us, just as all of creation was once perfect in goodness. Everything was good then, until rebellion, pride and jealousy entered into the heart of Satan, who rebelled against Him and boasted that he would sit at the throne of God, only to be cast down, away from heaven. From there, Satan tricked and lied to our ancestors, that they were deceived and sin entered into the hearts of mankind. Ever since then we had been made dirty by the presence of sin in us, and yet in each one of us good is still present. And just like all of us, He has a Name, and a Name was given Him, that is Jesus, which in the original Aramaic is Yehosuah in approximation, containing the Name of YHVH, that is the Lord. Yes, that is in conjunction with the other name that Jesus is known, that is Emmanuel, or God-is-with-us. Yes, the very Name of Jesus is Holy and great, for it is the Name of God Himself, and not just any gods, but the One and only True God who dwells with us, by being born into the world, in order to be our Saviour. He came into this world and began His ministry, of healing, of teaching, of feeding the people of God. He gave a great revelation on the nature of God and His love. Indeed, as we all know, that God so loved the world, that He gave His one and only Son, Jesus Christ, so that all who believe in Him will not perish in death, but gain eternal life, which was promised to us by the Lord Himself. Jesus came into this world with power and authority, and not just any kind of authority or power, but the true authority, out of whom all authorities came about. There can be no power or authority that does not have its source in Jesus. Even the devil, Satan, who had reigned mercilessly upon us as our jailor in the slavery by sin, and who had exercised power and control over us, was powerless and is powerless, and will ever be powerless before Jesus. The evil spirits feared Him, and said His Holy Name aloud to the people to hear, that is Jesus, the Holy One of God, the Christ Himself. They trembled with fear upon hearing His Name, knowing the fate that they will suffer at the hand of God’s justice. They were once beautiful angels in heaven, but they followed the devil, once Lucifer, the brightest and greatest angel into his rebellion as I mentioned earlier. Ever since then, they were doomed, and destined to suffer for eternity by God’s justice. The Lord’s authority is over everything, every single matter that exists in our universe and beyond. He is the Lord of all things visible and invisible. That is why even at the utterance of His Name, every knee and every beings shall bow down, genuflect, even flat to the floor! Yes, every beings, everything created by God, be it angels, mankind, animals, plants, or even the demons, the evil spirits, and Satan the great enemy of all himself. Yet, brethren, sadly, many of us these days seem to take lightly upon this Most holy Name of all names. They made fun of His Name and disrespected His glorious Name. 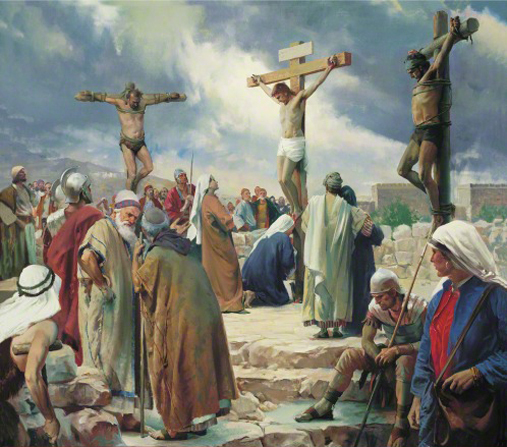 They did not respect the Name of the Lord, through whose sacrifice on the cross, we have been made whole once again, and gained the hop e of life eternal in Him. We instead prefer to deal with the devil, just as our ancestors had done, and glorify him instead of glorifying the Lord in Jesus. This must not be the way we live our lives, brethren in Christ! We have to seek a total and complete change of our wayward ways, and seek to rectify the impropriety we had done upon the Lord. Keep the Lord’s Name sacred and glorified, just as He had commanded us in the Ten Commandments He gave to Moses. We cannot mock or disdain the Holy Name of Jesus. Remember, brethren, the power of the Holy Name is powerful. If we are faced with a great power of evil, and we recite this great Name with faith, that is with true faith, and if we are upright in our lives, then no power, no matter how great or how evil it may be, can assail us. God Himself will come to protect us, and those who are against us will flee in fear, because they know that God is with us, Emmanuel! Jesus indeed! The One whose Name is exalted above every other names! Yes, let us all give glory to our Lord Jesus, and glorify His Name from now on if we have not done so. Come Lord Jesus, be with Your people, and with Your children, and deliver us from the evil one, with the might of Your hands and with the glory of Your Name! On the eighth day the circumcision of the Baby had to be performed; He was named Jesus, the Name the angel had given Him before He was conceived. When the day came for the purification according to the law of Moses, they brought the Baby up to Jerusalem, to present Him to the Lord. As it is written in the law of the Lord : “Every firstborn male shall be consecrated to God.” And they offered a sacrifice, as ordered in the law of the Lord : a pair of turtledoves or two young pigeons. You know that He is the Just One : know then that anyone living justly is born of God. See what singular love the Father has for us : we are called children of God, and we really are. This is why the world does not know us, because it did not know Him. Beloved, we are God’s children and what we shall be has not yet been shown. Yet when He appears in His glory, we know that we shall be like Him, for then we shall see Him as He is. All who have such a hope try to be pure as He is pure. Anyone who commits a sin acts as an enemy of the law of God; any sin acts wickedly, because all sin is wickedness. You know that He came to take away our sins, and that there is no sin in Him. Whoever remains in Him has no sin, whoever sins has not seen or known Him. If I may advise you in the Name of Christ and if you can hear it as the voice of love; if we share the same Spirit and are capable of mercy and compassion, then I beg of you make me very happy : have one love, one spirit, one feeling, do nothing through rivalry or vain conceit. Brothers and sisters in Christ, many of us like to deny the Lord and those who had worked hard to bring God closer to us through their teachings. Instead we often let ourselves be swayed by the forces of this world, that we end up following the ways of the world instead of the ways of God. We doubt the presence of God in us, and put our trust instead in the weakness of men and the pleasures of the world. Indeed, brothers and sisters in Christ, today, we deal with the theme of the authority of teaching of the faith, and the truth about what had happened as the Lord had done, when He once came into this world as man, Jesus Christ our Lord. This truth had been told across generations through the prophets, before the Lord came, and after His death, resurrection and ascension into heaven, by the Apostles and the countless saints who stood up for their faith in God. These saints and holy people stood up for the Lord, defending the faith they have in God, protecting the deposit of the faith that is in the one and only Church of God, the Catholic or Universal Church. These teachings were passed down to us today through the bishops and the priests who succeeded the Apostles and the other leaders of the early Church, through whom they passed down whatever had been revealed to them by Christ Himself and by the Holy Spirit. These saints testified for the Lord who had come to save the world, and through their testimony and their teachings, again passed down to us through the Church. Through these teachings we are brought close to the Lord, and it is revealed to us what the Lord wants from us, that is to follow Him and be saved. But the devil certainly did not stay quiet and let everything go smoothly according to the Lord’s plan. Just as he had tried so much to undermine the good works of the Lord by tempting Him directly, and when that failed, by opposing Him in every turns and corners, questioning His authority and teaching through the Pharisees and the scribes, and many other ways that he had employed to keep mankind away from salvation in God. Satan opposed the Lord and all of His faithful ones, by sowing the seeds of dissension, jealousy, pride and arrogance in the hearts of the enemies of Christ. As in the Gospel today, the Pharisees and the scribes questioned the authority of John the Baptist, that is under whose authority he did all the baptisms and the teachings about the coming of the Messiah. They should have known about the coming of John the Baptist as the herald of the Messiah, because after all they are the learnt ones, the ones who knew the Scriptures inside out in their heart. They instead gave in to their human vulnerabilities, that is they let Satan into their hearts, and they in essence, become the tools of Satan through which he tried to undermine the works of our Lord to save us. Such an irony indeed, and sad indeed, that the very leaders of the people, the supposedly pious and educated ones at that, were the very ones that betrayed the Lord. This is because they gave in to vanity and human greed, the greed for authority, power, as well as the jealousy of human heart and desire, which is for power and influence within the society, within the society of the people of God. They resented those who they perceived to be undermining their own teaching authority, for the Pharisees and the scribes advocated a very strict observation of the laws of Moses and did not entertain any kind of dissent against what they taught. And as you know, the Pharisees and the scribes continuously harassed Jesus and His followers, and right up to when they delivered the coup de grace, condemning Jesus to death with false witnesses, testimonies and accusations that led to the crucifixion of Jesus. And Satan surely rejoiced at that moment, for he thought that he had undermined the Lord’s plan to save us. And yet, what he had done was merely part of the Lord’s salvation plan, made fulfilled through the death of Jesus on the cross. After that defeat, Satan did not give up. He continued to try to deceive the people of God through his lies spread through many false prophets he sent to the world. Today we celebrate the feast of two great saints of the Eastern Church, who were brave and courageous defenders of the faith, fighting constantly against the heresies of the faith in the Church spread exactly by these false prophets. They are St. Basil the Great, also known as St. Basil of Caesarea, and St. Gregory Nazianzen, also known as St. Gregory of Nazianzus. Both of them were renowned theologians and leaders of the faithful, living at the time of the fourth century after the birth of Christ, after Christianity had become the majority faith of the people of the Roman Empire. A preacher named Arius spread unorthodox and heretical teachings about Christ. That Jesus Christ is not equal to the father as the Son of God. Instead of the true faith and teaching that God the Son is equal in all aspects to the Father and the Holy Spirit, one in unity and essence, existing before all ages, Arius preached that the Father is superior to the Son, and Jesus was created rather than existing with the Father, being begotten not created. Arius’ teachings spread wildly across many parts of the Roman Empire, converting many people to this heretical teaching of the faith. He was wildly popular and swayed many to sin by believing in the falsehood of the devil. It was St. Basil the Great and St. Gregory Nazianzen who led the people of the true and orthodox faith in the campaign against the heresy of Arius, also known as Arianism. We were warned by St. John the Evangelist on the presence of false prophets who would lead the people astray in their path towards the salvation in God, and the example of Arius had proven just to be the case, as much as many other heretics and false prophets who appeared both before and after him. St. Basil the Great and St. Gregory Nazianzen tirelessly championed the cause of the true faith, often in opposition even to the people whom they were shepherding and leading, who had been corrupted by the false teachings of Arius. Yet they did not fear and continued to work hard, at times even they have to suffer persecution and suffering, as well as rejection and mockery by those who supported the false faith and the lies of the devil. Nevertheless, they continued to move on, and on, and on, until their death, they never ceased to work hard to purify the faith from these lies of the devil and all the seeds of falsehood that he has planted in the hearts of the Lord’s faithful through his false prophets. Even today, brethren, false prophets can be abound, numerous, and we often may not know who they are. That is why, it is important for us to deepen the knowledge and understanding that we have of our faith in God. We cannot be idle or lest we risk to fall into the corruption of the lies of the evil one. Hold firmly on the deposit of faith, and the richness of the teachings that had been handed down to us from the Lord and His Apostles, through the Church. Dear brothers and sisters in Christ, let us ask St. Basil the Great and St. Gregory Nazianzen to pray for us, that we will be protected by the Lord and His angels, so that we will not easily fall prey to heresy or succumb to the lies and temptations of the evil one. Let us also help one another, that we can keep all the faithful ones in God to remain faithful, now and till the end of time. God be with us all. Amen.